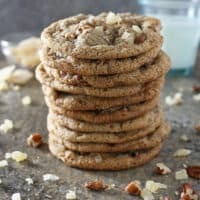 Loaded with candied ginger and powdered ginger, these gluten free Ginger Pecan Cookies are a cinch to whip up and can be made ahead and stored until you need to whip these up for Christmas cookie exchange parties and holiday get-togethers! But, Christmas is my all time favorite holiday, and early decorations and displays are just a reminder to me that I need to start menu and cookie planning soon! In October of years past, planning is all I would do. But, this year is different. 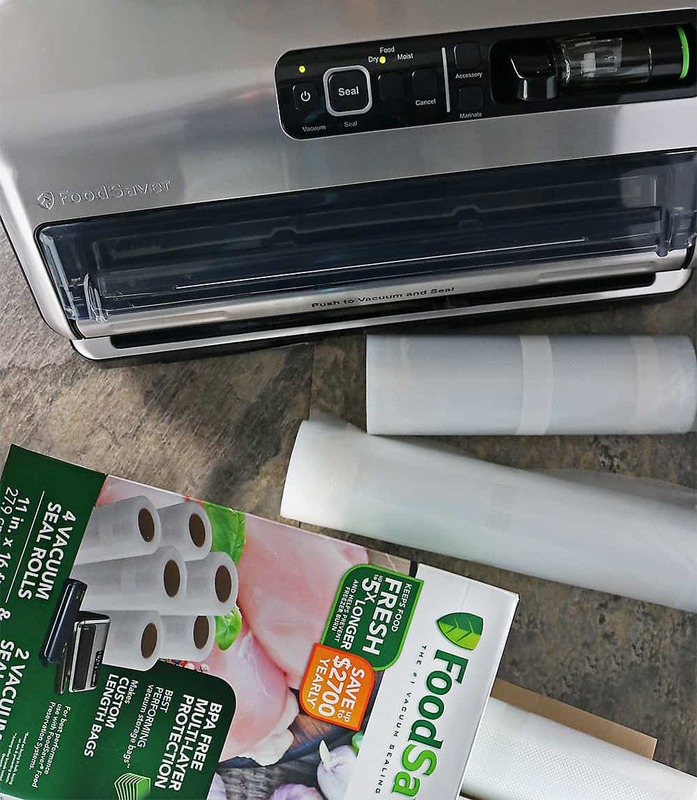 This year I have the FoodSaver® FM5330 Vacuum Sealing System and FoodSaver® Heat-Sealed Bags to take me from just planning to actually doing! When it comes to saving food and time, FoodSaver® is the solution. 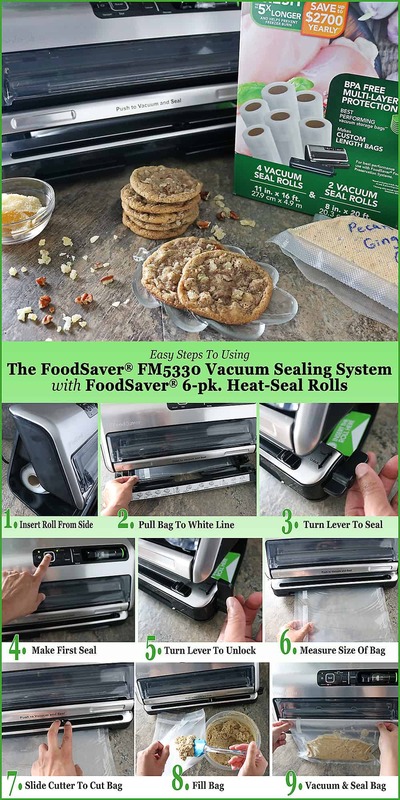 As seen on TV, FoodSaver® is the number 1 Vacuum Sealing solution in the US. FoodSaver® helps keep food fresh for up to 5x longer than ordinary storage methods like zipper bags, foil, plastic wrap, and containers, and helps prevent freezer burn. And, FoodSaver® makes entertaining a breeze enabling you to marinate in minutes instead of hours! 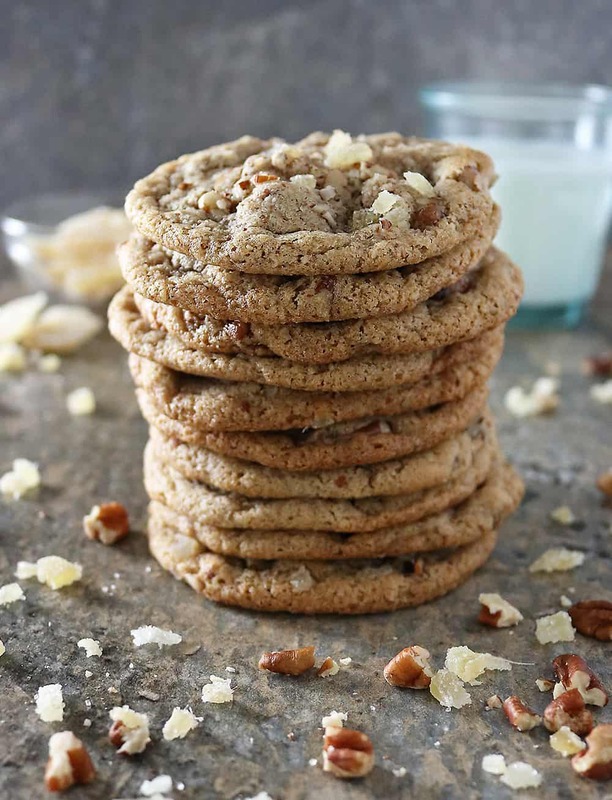 But that’s not all, FoodSaver® FM5330 Vacuum Sealing System helps prep, cook and store meals way ahead of time – like when I made these gluten free, Ginger Pecan Cookies. 9) Vacuumed and sealed bag to store the cookie dough in until needed. 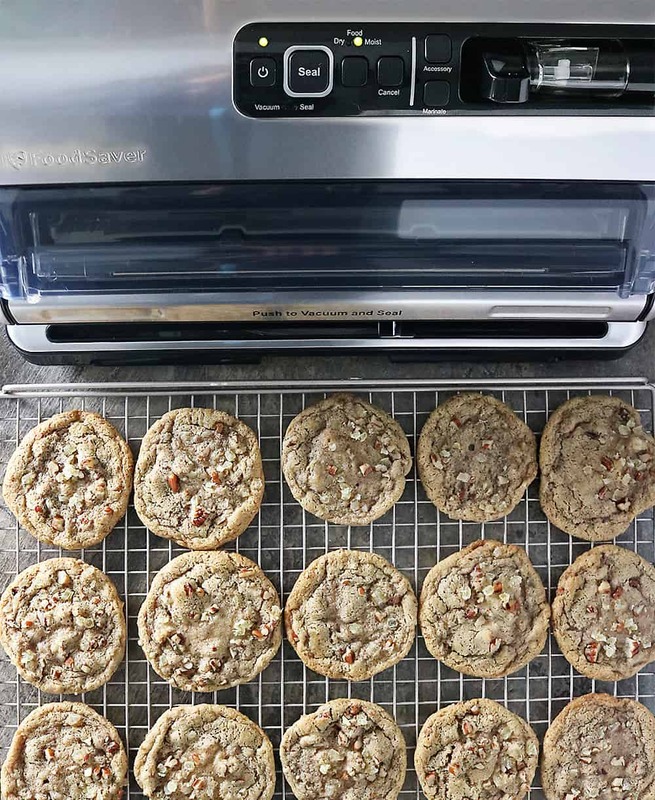 With the FoodSaver® FM5330 Vacuum Sealing System and multi-layer, BPA-free, FoodSaver® Heat-Sealed Bags, I was able to prep and store these gluten-free, Ginger Pecan Cookies way before Christmas cookie exchange parties and gift giving. Of course I baked a batch to test out on share with my daughter and coworkers and all parties gave these a thumbs up. These Ginger Pecan Cookies are loosely based on these Chocolate Peppermint Cherry Cookies, only I replaced the all purpose flour with a mixture of gluten-free flour and pecan flour which I made by grinding up pecans in my blender. Ginger and candied ginger gave these cookies a nice little zing. Over the next couple of months, I plan on adding more vacuum-sealed cookie dough packages to the freezer to keep this package of gluten-free Pecan Ginger Cookies company. Then when holiday parties and Christmas cookie exchanges come around, all I need to do is pop these bags out of the freezer, open them up, cut the dough and bake and BOOM, fresh cookies! You can find the FoodSaver® FM5330 Vacuum Sealing System and FoodSaver® Heat-Sealed Bags at most Kohl’s stores. Also, check them out of their social channels on Facebook and Instagram for ideas and inspiration! 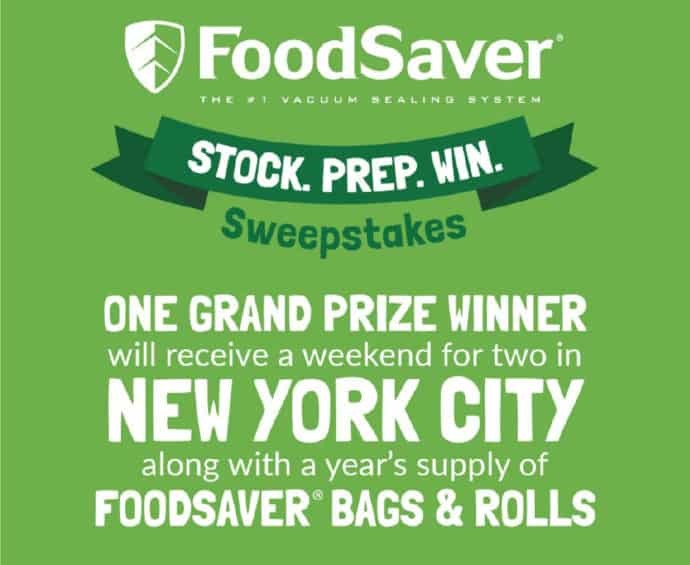 By the Way, currently, you can enter to WIN A TRIP FOR TWO to NYC along with a years worth of FoodSaver® bags > here! Stocking up with FoodSaver® bags and rolls this harvest and holiday season has is perks, every bags and rolls purchase gets you closer to NYC! Sweepstakes runs from 9/23/18 – 10/21/18. Add 1 1/2 cups of the pecans to a blender and pulse until resembling a flour like consistency. Don't overblend as this would leave them to become pecan "butter" - when done, set aside. Cream butter and sugar in a bowl using an electric mixer. Then add in the eggs one at a time, blending so all ingredients are well incorporated between each egg. 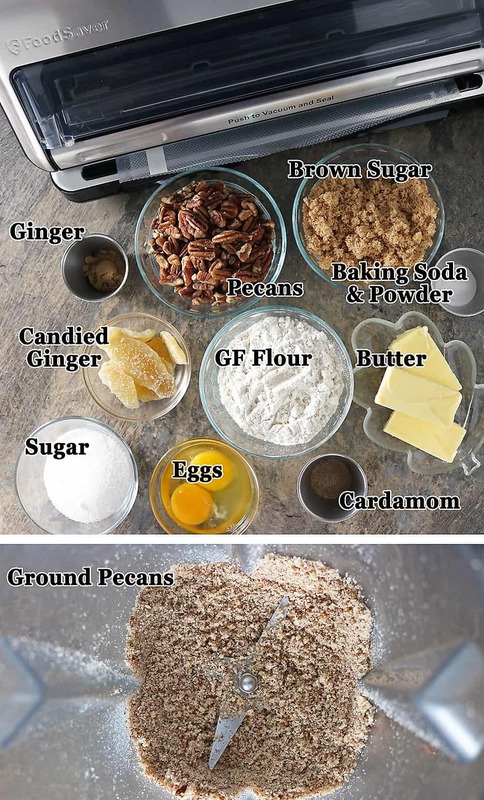 Add the gluten free flour, baking soda, baking powder, ginger, cardamom, and ground pecans to a bowl and mix well. Then add the dry ingredients into the bowl with the wet ingredients, a little at a time and mix so all ingredients are well incorporated. Cut the candied ginger into tiny pieces and add those as well as the 1/2 cup of pecan pieces to gough and mix with a spoon. If freezing dough, then vacuum seal and save dough until needed. 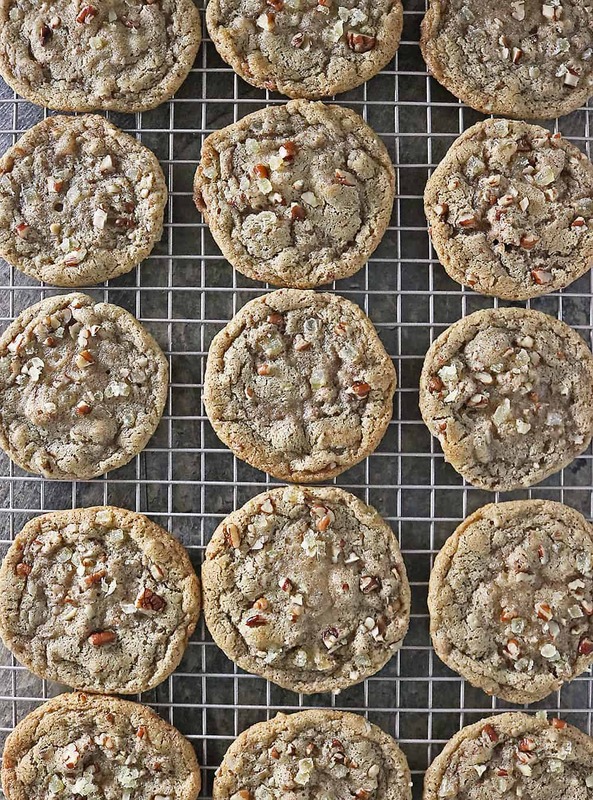 However, if you plan on enjoying these Ginger Pecan cookies soon, then chill dough for at least a couple of hours. Then, preheat oven to 325. Line a baking tray with parchment paper. break of tablespoonfuls of chilled dough, roll into rough pieces and bake for 10-12 minutes at 325 degrees. •When you plan on using the frozen dough, make sure to remove it from the freezer and place in the refrigerator for at least 6 hours. Then, break off spoonfuls and bake at 325 for 10-12 minutes on a parchment lined baking tray. 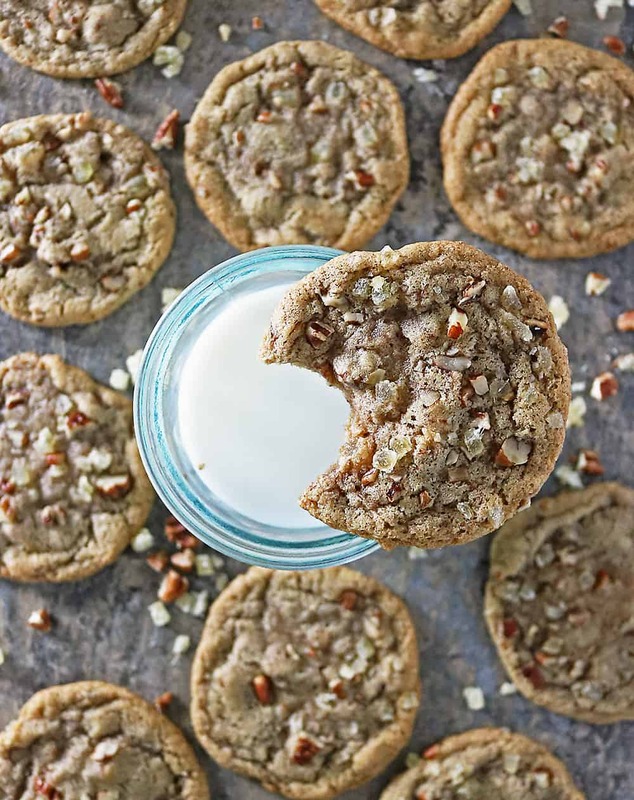 They look perfectly chewy with crisp edges…awesome cookies! These sound absolutely amazing!! They look so crisp and chewy, plus I love that you can make them ahead! These cookies look delicious, yummo! I can almost smell them through my computer screen. I’ve been looking into getting a food savor. Thanks for the step by step tips and review of the product. The cookies look delicious too! Great minds think alike Shashi! In terms of bringing out the ginger based recipes that is! Ginger is one of my most favourite spices to bake with and I’m rolling out my gingerbread loaf cake recipe next week. But for now I’ll get my ginger fix from these delicious Ginger Pecan Cookies. Yum! That Foodsaver Vacuum Sealer would also come in mighty handy. If these cookies dont shout fall flavors I dont know what does these sound perfect for the season! I LOVE candied ginger and have never had it in a cookie. I can’t wait to try these! Sounds perfect for my cookie exchange. P.S. These photos are GORGEOUS!!!! These cookies sound delicious, Shashi! I love ginger (especially around the holidays) and the crunch from pecans would be a great addition. We have that same FoodSaver, and I love it! We use it all the time. But I’ve never thought about stocking up on Christmas cookies ahead of time. Excellent idea! I’ll have to start this weekend…and then I’ll have to try not to eat them all first! Haha. Hope you and Lil S have a great weekend ahead, my friend!